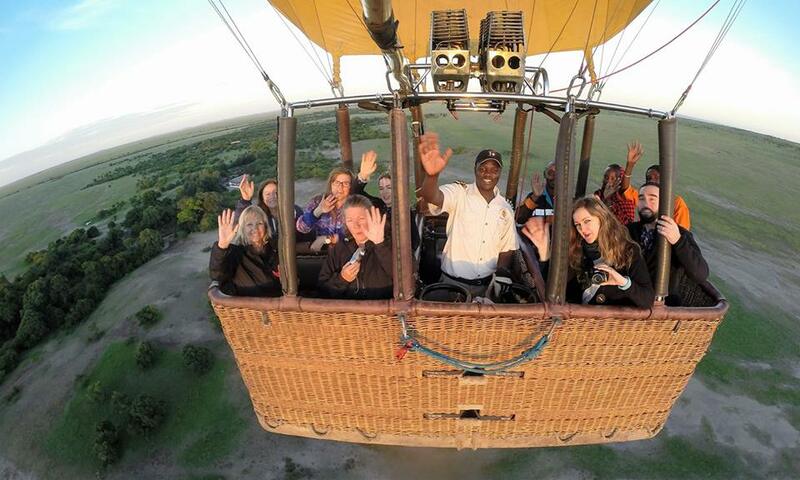 On one of my recent tours, I was lucky enough to be given the opportunity to experience a hot air balloon safari over the Maasai Mara – at sunrise. This balloon safari would have to be one of the most memorable surreal experiences of my life. And it started way earlier than in the air! There’s a kind of adrenalin rush when signing up to the balloon safari; that sense of adventure combined with an excited nervousness; especially given that there’s a wee element of risk factor involved, but also because it’s quite possibly a once in a life time opportunity for most. At 4:30 am in the morning we were picked up at our camp in the Maasai Mara by a member of the balloon safari company and driven at speed across the savanna for 1.5 hours to a camp near to our take-off zone. For me the experience started right then. As we hurtled across the dark still plains of the Mara, I was captivated by the stars that completely encased us. With all my very many times travelling in Africa I thought I’d experienced some pretty amazing night skies – but this was something absolutely incredible. For as far as the eye could see, we were surrounded by literally trillions of bright sparkling glittery stars, sprinkled very thickly across the sky. I felt I could’ve reached out and touch them. As we drove we watched the stars fade and the dark sky ever so slowly begin to lighten. We started to see the occasional early rising animal stirring as we drove by, lifting its head inquisitively before nestling back down for another doze, and the occasional zebra or buffalo stagger to his feet. We arrived at the assembly spot, checked in and briefed on our adventure, offered an early morning cuppa and a slice of lovely home baked loaf before being bundled back into safari jeeps and driven to the take-off balloon zone. Lots of very important checks were carried out, with highly technical gauges and gadgets before it was time to climb into the balloon basket, ready for take- off. Climbing into the basket was an interesting process; with the basket lying horizontal to the ground, we climbed into our designated compartments while lying down with legs up around our chests, hanging on to the hand straps for dear life, I might add. Our Captain Barnabas was fantastic, and explained the take- off procedure in great detail, so we knew exactly what to expect. Before we knew it, we could feel the basket shifting into the upright position, and then we were gently floating above ground, and gliding across the savanna, the only sound being the occasional puff of balloon air. It was simply breath taking and for me, a very surreal experience. Watching the sun rise over Africa, with the silhouette of other balloons in the distance was truly spectacular. The silence as we glided across the Mara sometimes barely skimming tree tops, game spotting below, watching groups of wildlife going about their morning rituals and routines was simply magical and something I will never ever forget it. We were lucky that morning; the savanna was a hive of activity. We spotted prides of lions with many little cubs and in one pride the lionesses had freshly killed prey beside them. Some of the cubs were munching on the kill, while two adventurous babies had crossed the river and you could just see the mums trying to coax them back. We saw giraffe sauntering across the savanna and hidden amongst acacia trees; great herds of buffalo grazing on the green grass; loads of zebra; large herds of elephants gathered under trees; and many species of birds – vultures and eagles perched in the tree tops eyeing up prey below. As if the balloon experience wasn’t magical enough, when we landed we were bundled into safari jeeps and escorted to a sumptuous champagne breakfast, in the wildest setting you could possibly imagine – on the savanna, under an acacia tree, just a stones through from some of the wildest animals on the planet. The beautiful portable dining setting was gorgeous; chefs in white pristine uniforms complete with high top hats cooking up delectable delights, the white clothed tables, the champagne flutes flowing, laughter and sharing of balloon stories – it was all quite something else! It was a very unique experience game driving from above, looking down on the savanna and wildlife, and then casually having breakfast amongst Africa’s wildlife territory. It was most definitely one of those incredible moments that will stay in my memory for ever.